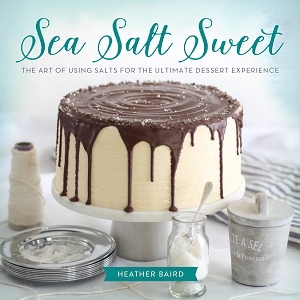 Lately my home has been filled with the scent of warm vanilla and cooked sugar. I've been making every incarnation of caramel I can think of. I can't help it. It's something I love to enjoy during the fall months. I've been leaving a trail of crumpled wax paper squares everywhere I go. Why do I even bother wrapping homemade caramels, honestly?! This is a caramel recipe that I've been dying to share. 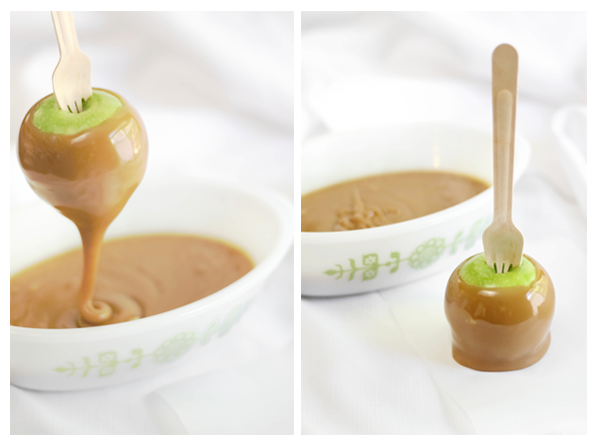 It makes the glossiest, most perfect caramel apples I've ever seen! And, as if that weren't enough to soothe a fierce sweet tooth, I've added a layer of chocolate chip cookie dough. 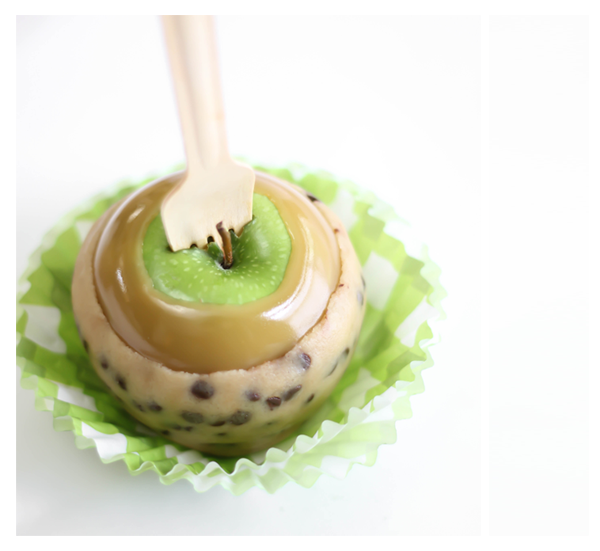 Wrapping the caramel apple in cookie dough is easy. Just make sure the caramel is set before you start. I chose to leave part of the caramel exposed, but you could certainly wrap the entire apple in cookie dough. Begin by rolling the cookie dough between sheets of wax paper. Chill the dough then cut into strips. To get a clean line when cutting, don't drag your knife through the dough - the chips will drag and make a very ragged edge. Instead, cut strait down with a sharp knife. This will cut through the chocolate chips and make a more precise edge. Next, place the dough onto the caramel apple and press it on firmly. The dough will spread around the apple as you press. Tuck the excess dough under the apple. 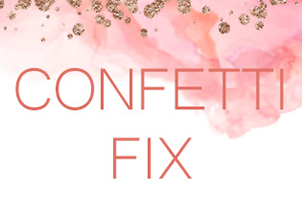 Serve in cute cupcake papers. Refrigerate leftovers - that's it! Is it just me, or do these guys kinda look like they're wearing leopard print? Even if you're not starry-eyed over the cookie dough coating, I hope you'll try the caramel recipe for covering apples. It's one of the tastiest I've tried! Place a large sheet of parchment paper on a work surface, or grease a large jelly roll pan with shortening. Set aside. Clean and dry the apples well. Remove the apple stems and carefully punch a guide hole for the ice pop sticks with a knife or skewer. Insert sticks into guide holes. Lift each apple to make sure each can securely be picked up. For the caramel, stir together the condensed milk and heavy cream in a 4-cup measure with a spout. Combine corn syrup, dark brown sugar and granulated sugar in a large pot. Bring to a bubble over high heat. When mixture boils, add butter. Stir until butter is melted and reduce heat to medium-high. Add milk mixture in a small, steady stream while whisking continually so that the caramel keeps a slight boil. Reduce heat to medium and attach a candy thermometer. Bring to 250F. Remove from heat and stir in vanilla extract. Wait until bubbling subsides and the caramel has a smooth, glassy surface that is bubble-free. Tilt pan slightly so the caramel pools to one side. Dip apples and place them on parchment. Allow them to set completely, about 1 hour. For the cookie dough, stir together flour, salt, brown sugar and granulated sugar in a large mixing bowl. Pour in butter and vanilla extract. Mix until a dry dough forms. Add chocolate chips and mix on lowest speed. When chocolate chips are evenly dispersed, add milk 1 tablespoon at a time with machine on low speed. Turn the cookie dough out onto a large sheet of wax paper. Top with a same-sized piece of wax paper and roll dough to 1/4-inch (or as thinly as the chocolate chips will allow). Chill the dough for 20 minutes then cut into strips. To get a clean line when cutting, don't drag your knife through the dough - the chips will drag and make a very ragged edge. Instead, cut strait down with a sharp knife. This will cut through the chocolate chips and make a more precise edge. Next, place the dough onto the caramel apple and press it on firmly. The dough will spread around the apple as you press. Tuck the excess dough under the apple. Serve in cute muffin-sized cupcake papers. Refrigerate leftovers. Note: the cookie dough application is a very forgiving process. If your dough tears or crumbles, simply pick up dough pieces and patch them onto the apple. The apples can be perfectly and seamlessly smoothed with your hands/fingers. All I can say is these look incredibly dangerous. Amazing but dangerous. 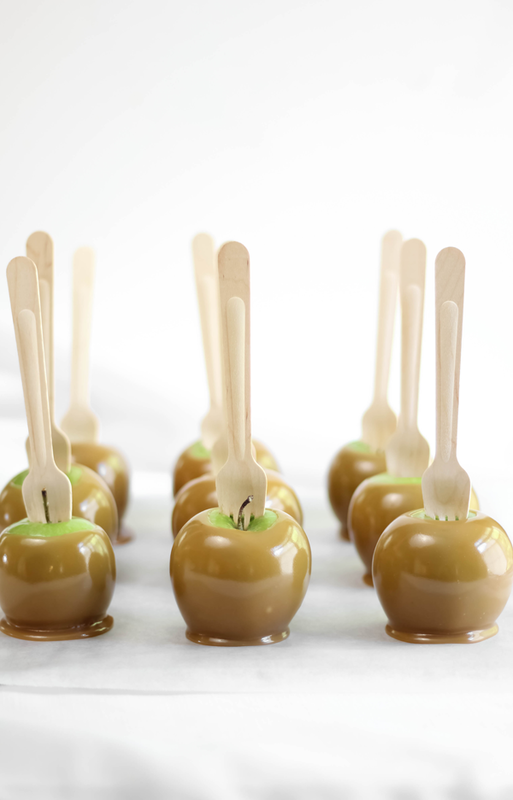 Could caramel apples get any better? I'm smitten! Holy WOW! I am in love with these! Truly awesome! This is a genius idea! 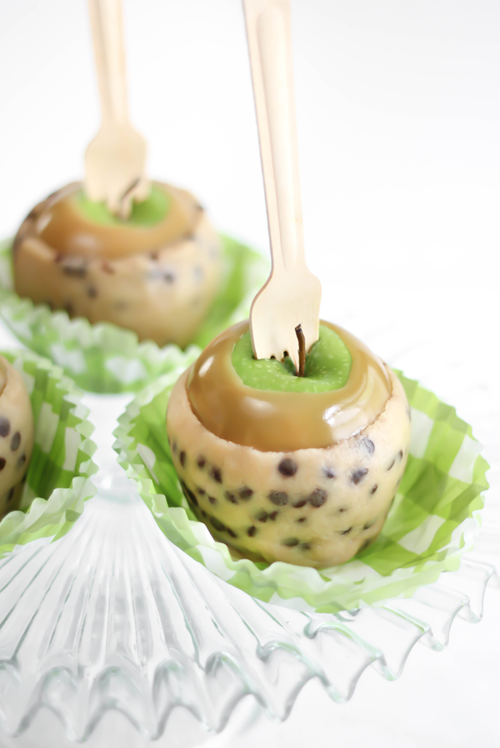 Love that it's something a little fancier than your typical caramel apple. Your caramel is perfection! This is out of control amazing! What a great idea and creation! Those caramel apples look amazing. 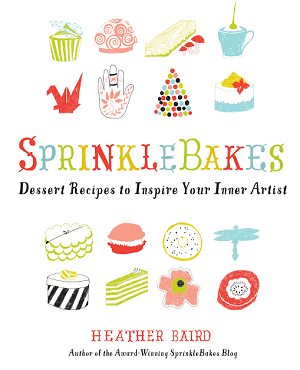 This is so incredibly creative, Heather! 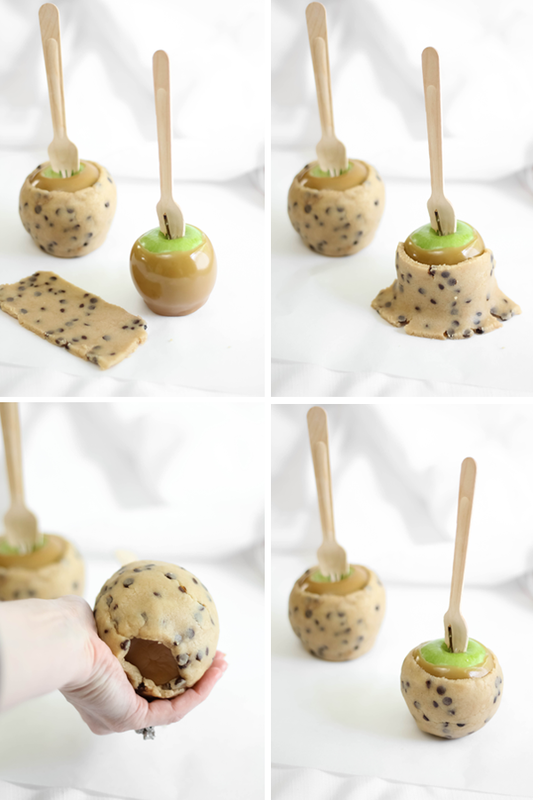 I never would have thought of cookie dough to cover a caramel apple. Lovely styling and photos, as always. :) Thanks for sharing, girl! This is such a strange combo but is natural too! I have got to true these before apple season goes! Wrapping this up in cookie dough is pure genius! Oh, I wish I didn't have to tell you this, but flour is considered a raw food, and since it is grown in soil, it can be contaminated with e coli and other bacteria. Cookie dough has been implicated in infectious disease outbreaks of e.coli and salmonella; the most likely culprit is not the eggs, but the flour. I'd recommend you use a commercial cookie dough which is pasteurized for safety. I don't know how you come up with this stuff, but you manage to blow my mind with pretty much every post! AWESOME idea!! 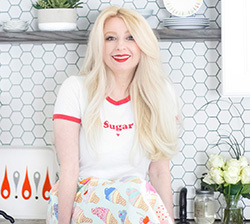 @Claudia - I consulted the writer of The Cookie Dough Lover's Cookbook (Lindsay Landis, also writer of Love and Olive Oil blog- she's fab!) when she attended my book signing in Nashville. She certainly did her due diligence on this issue and found the flour to be of equal safety as the raw foods and veggies we get from the produce section at the supermarkets. She recommends that if you're concerned about eating raw flour, then toast the flour at 350F in the oven for 4-5 minutes. 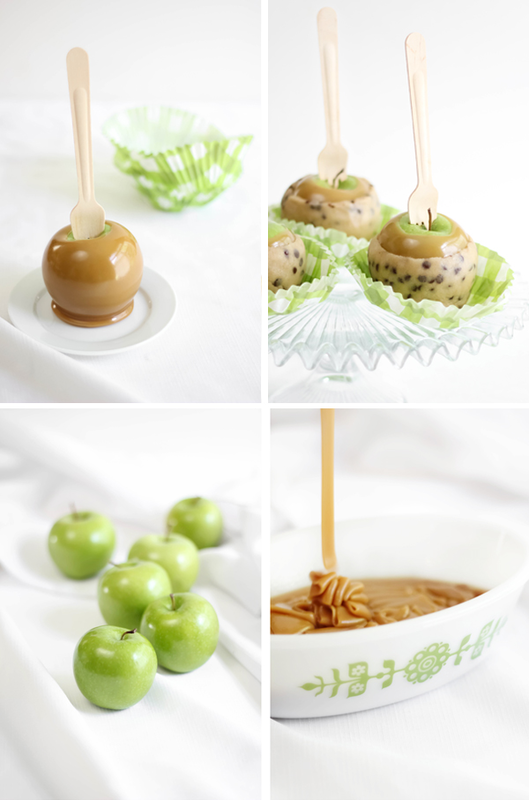 Amazing photos of the best looking caramel apples I've ever seen! My daughter's going to think she died and went to heaven. Thanks so much! Best recipe EVER. Love it!!! Oh wow!! Your caramel looks perfect!! And seriously? cookie dough?!?! GENIUS! um, these look AMAZING! Yum yum yum!! Do you mean that you eat raw cookie dough? Where did you even get that idea?? It is just brilliant! Looks beautfiul and yummy! wow!! Your caramel looks perfect!! And seriously? cookie dough?!?! GENIUS! These look and sound amazing. And your photos?! Wow - perfection. Bravo. These are just so pretty. The cookie dough band is a great addition. I am... obsessed! I love making caramel sauce but haven't made caramel apples from scratch before... but this, omg! 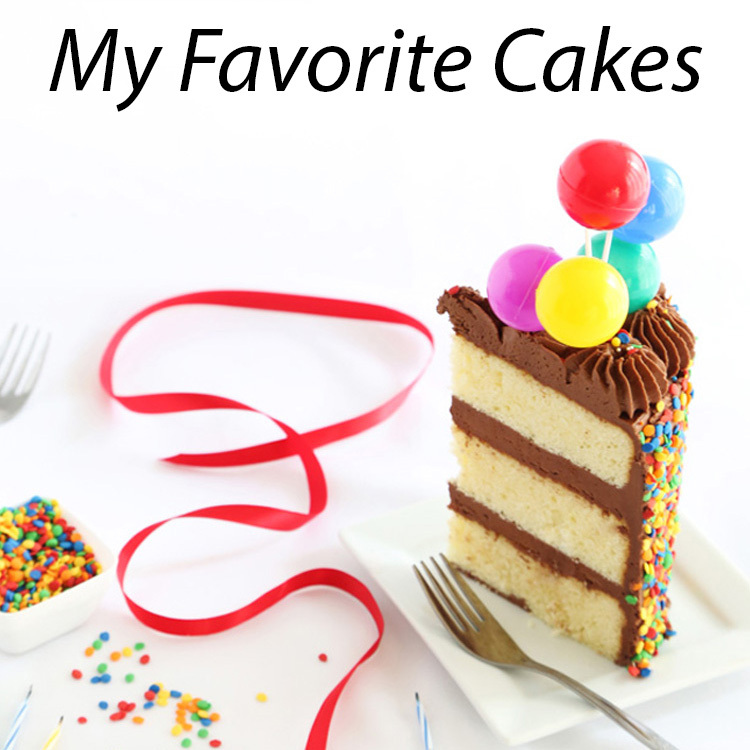 I made these yesterday and the caramel was perfect, seriously! So incredibly delicious and chewy. It did come out a little thick, probably because it took a while before reaching the correct temperature. That didn't make it any less scrumptious, mind you. Thank you so much! I desperately need these in my life. o.m.g. Yum, this will be an awesome recipe to make for my Halloween Party i am planning next month. I live in france and can't get a hold of light corn syrup. Any substitutes? Any substitutes for the light corn syrup? I'm in France and its not available here. Hi Jessica! I haven't tried it, but TLC cooking suggests golden syrup as a substitution for light corn syrup. Hope this helps! These are just ridiculous. In the very best way possible. Ah, thank you so much for the heads up! Added!